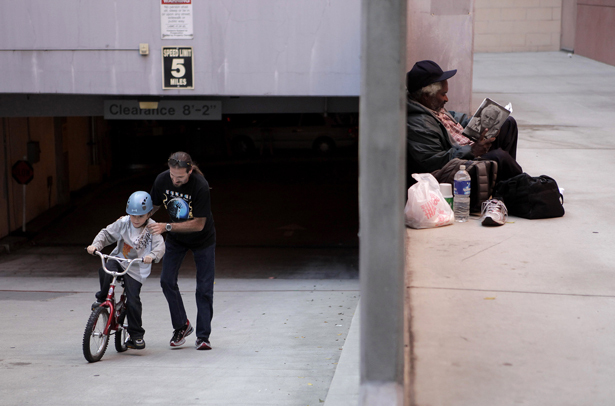 Can a ‘Homeless Bill of Rights’ End the Criminalization of LA’s Most Vulnerable Residents? After years of harassment by the police, homeless Angelenos and their allies fight back. “We are human beings who live here,” Silvia Hernández says emphatically. The policies that have been keeping these forces busy are a tangle of old and new initiatives, some of which extend back decades, others of which are newer innovations. What unites them is a tendency to criminalize routine, often unavoidable, behavior by people forced to make their home on the streets: sleeping on the sidewalk, sleeping in a car, lining up for a meal at a soup kitchen. Over the years, activists and advocates have tried to challenge these measures, often in court, but the city’s overall criminalization policy has proven remarkably resilient. Now, however, a coalition of community groups has come together to push statewide legislation that would enshrine the basic rights of homeless people in California law. If passed, the legislation will protect homeless Californians across the state—in San Francisco, San Diego, and the many points in between—but it will have particular resonance for the tens of thousands of Angelenos who sleep each night on the streets. In total, the LA region has a homeless population somewhere between 36,000 and 54,000 men and women, with a significant majority—as many as 76 percent—considered “unsheltered” by Department of Housing and Urban Development. State data compiled by HUD indicates that Los Angeles has the highest population of chronically homeless individuals (sometimes described as long-term street homeless) in the country. “We can no longer accept the ‘out of sight, out of mind’ approach that is behind these laws and enforcement efforts,” Eric Ares, an organizer at the Los Angeles Community Action Network (LA CAN), wrote in an e-mail. LA CAN is the lead Southern California organization pressing the new rights-based legislation. To understand just how relentless LA’s anti-homeless efforts have been, it helps to rewind the clock several decades. As far back as the late 1960s, LA’s elected leaders were passing punitive ordinances like the one, still technically on the books, stipulating that, “no person shall sit, lie or sleep in or upon any street, sidewalk or public way.” This wasn’t rigorously enforced at first, but the police embraced it, zealously, around the turn of the millennium—just as efforts to gentrify historically desolate downtown were beginning to bear fruit. Then, in 2006, a federal appeals court ruled that LA could not enforce any ordinance prohibiting people from “sitting, lying, or sleeping on public sidewalks” as long as the homeless population exceeded the number of beds available for them. The law was effectively invalidated—for a time. Just a few months after the ruling, the LAPD announced that it would deploy fifty more uniformed officers in Skid Row—an additional cop for every single block in the neighborhood—as part of the city’s Safer City Initiative (SCI). The initiative was typical of then-police chief William Bratton’s “broken windows” policy, focusing on the rigorous enforcement of minor infractions. Twelve thousand citations were issued during the first year the policy was in effect, the vast majority of which were for pedestrian infractions like crosswalk violations. Silvia Hernández did not share Watson’s ambivalence, calling post-SCI policing “incredibly repulsive.” She recalled officers kicking her and a friend awake at 5 am, intentionally harassing mentally ill women for pleasure, illegally asking for ID, and handcuffing longtime residents daily with little or no justification. There have been other discriminatory ordinances, which have often been followed by legal challenges and, not infrequently, rebukes by the courts. In 2012, for instance, a panel of the US Court of Appeals for the Ninth Circuit barred the city from seizing and destroying personal property kept on sidewalks. And in June of this year, the same court unanimously ruled that a prohibition against living in vehicles was unconstitutional. The court cited the vagueness of the law—“broad enough to cover any driver in Los Angeles who eats food or transports personal belongings in his or her vehicle”—resulted in “arbitrary and discriminatory enforcement” against the homeless. Despite these legal defeats, the business community and its allies both on the LA City Council and in the LAPD have simply generated new policies criminalizing common activities. Roughly fifty organizations throughout Los Angeles run outdoor operations providing free meals for the homeless, and these can draw crowds that number in the hundreds to the sidewalks of gentrifying neighborhoods like Hollywood, eliciting complaints from local residents. In response to these complaints, two Democrats on the City Council proposed a resolution to ban the feeding of homeless persons in public. Local community groups were able to mobilize to make sure an ordinance was not passed, but the incident highlighted the need to be proactive rather than reactive when it comes to protecting the rights of the most vulnerable. So when Rhode Island passed a statewide, comprehensive “Homeless Bill of Rights” in 2012, local organizations took notice. Groups throughout California and the west reached a consensus that a bill like this could stem the tide of anti-homeless legislation that showed no sign of receding on the municipal level. LA CAN took the lead in Southern California; it is one of ten regional groups united under the organizing umbrella of the Western Regional Advocacy Project (WRAP). Eighty-eight local groups have endorsed WRAP’s aims, which currently include statewide legislation in California and Oregon. Assembly Bill 5 (AB 5) was the coalition’s first shot at a Homeless Bill of Rights in California. This comprehensive legislation focused on six rights identified by the groups: the right to rest and move freely in public, the right to occupy a legally parked vehicle, the right to serve food and eat in public, the right to legal counsel, the right to invoke a “necessity defense” before a judge and the right to access twenty-four-hour hygiene facilities. Even advocates were surprised at how quickly the bill found sponsorship; Democrat Tom Ammiano introduced the legislation in December 2012. They were further surprised again when the bill passed the Assembly’s Judiciary Committee, though it died quietly in the Appropriations Committee in May of last year, due in part to questions about costs associated with the legislation, specifically the requirement for twenty-four-hour-hour hygiene centers. Opposition from groups like the California Chamber of Commerce and the League of California Cities surely didn’t help. Despite the loss, advocates left the session encouraged and determined to mobilize support while hammering out logistics that would answer legislators’ questions. And rather than pursuing a comprehensive bill, the coalition will now pursue the Homeless Bill of Rights campaign piecemeal, focusing first on the right to rest. Every advocate and activist I spoke with emphasized that even a comprehensive Homeless Bill of Rights would not constitute a long-term solution to homelessness. “I think it would be tragic if we saw it as a solution rather than an emergency measure,” said Cathy Albisa of the National Economic and Social Rights Initiative, an organization playing a “background role” on the campaign. As the gears of federal government have ground to a halt, a new energy has been rocking the foundations of our urban centers. From Atlanta to Seattle and points in between, cities have begun seizing the initiative, transforming themselves into laboratories for progressive innovation. This article is part of Cities Rising, The Nation’s chronicle of those urban experiments. John ThomasonJohn Thomason is a writer and former Nation intern.